View all products by e.l.f. 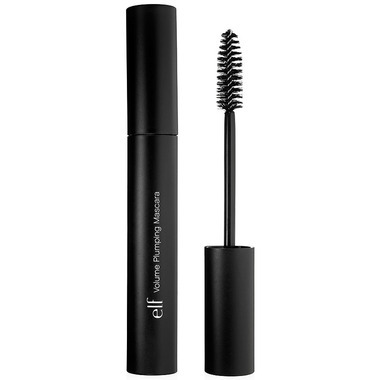 Create lush and bold lashes with e.l.f. Studio Volume Plumping Mascara. The oversized brush fully coats lashes from root to tip for an intense and dramatic effect. The Vitamin B rich formula conditions and strengthens for visibly healthier looking lashes. Not the best mascara, very sticky and clumpy, as well as being hard to get off. I am currently using Cover Girl Lash Blast, and since I have become vegan, I have been trying to replace it with a vegan mascara. I was so excited to find Elf cosmetics!!! But this mascara is not good in my opinion. The brush is terrible (it looked broken actually), and the volume is barely more than a natural lash. All other Elf products I have tried were great though! Other times that I have purchased this product, it was great but does not last for very long. It tends to dry out rather quickly. That is why I gave it 2/5. However, when it works, it's worth the amount you pay because it is affordable and cruelty free. This is absolute garbage. Almost no liquid in the bottle - looks like I have nothing on my eyelashes. Bone dry. Super disappointed. Threw it out after trying to make it work a few days in a row, and even added eyedrops to it to try to thin out the liquid... didn't help. not a bad mascara for this price. gives me natural looking lashes if that's what you are looking for. I was surprised at how much I like this mascara. Great coverage! For the price, this is great. A bit sticky, but you get good coverage. I have good lashes so it generally doesn't matter what I buy bc they will look good. This mascara was the exception. I don't know if I got a bad one or something but there is almost nothing on the brush, it makes pretty much no difference to my eye lashes. It's actually useless. I found the brush to be far too big. This mascara would likely be better for those with fake lashes or extensions. great product and adds nice volume to my lashes. i would absolutely buy this mascara again. This is the best mascara I tried so far! And it's so cheaper! Love this. Will definitely buy again. Great mascara! Goes on smooth, doesn't flake or clump. Love the price and the fact that it's vegan/cruelty free! Will definitely buy e.l.f. Studio Volume Plumping Mascara again.